Some dogs, like some people, feel things more deeply. Whether by nurture or nature or a mixed-up blend of both, they are more anxious, sensitive, and intense. Miles is one of these dogs. Miles had already been adopted and returned three times before they brought him home. Suellen believes he was born with issues that were made worse by mistreatment in his early months. From the start, he was dominant, aggressive, emotionally volatile with severe anxiety and object possession issues. They quickly realized that they were ill-equipped to deal with the depth of his emotional baggage and behavioral challenges without professional help. They started by calling Anti-Cruelty’s behavior hotline and participating in the organization’s basic training class, but neither provided enough support. They then enlisted the help of a professional trainer who taught them to recognize his anxiety triggers and avoid situations and circumstances that might set them off. Because of his severe object possession, they learned to trade up rather than trying to take things away (and risk getting bitten). Forgiveness, patience, positive reinforcement, and tons of unconditional love carried them through these difficult early years. After doing something particularly bad, Miles had a way of looking up soulfully as if to ask, “do you still love me?” And lucky for him, they still did. Edie often took the brunt of his anxiety. She suffered multiple bites; he peed on and destroyed her stuff and even ate her homework (for real). But all along, she continued to believe they could love the bad out of him. Suellen describes the tumultuous early years as one of the defining moments of her relationship with her daughter. Edie was determined to save him and Suellen questioned the message it would send her if they simply gave up and returned Miles to the shelter where he would face certain euthanasia. Although they had not intended to adopt a special needs dog, they did, and now had a responsibility to make things work. Miles and Lucy. Photo used with permission of Miles and family. 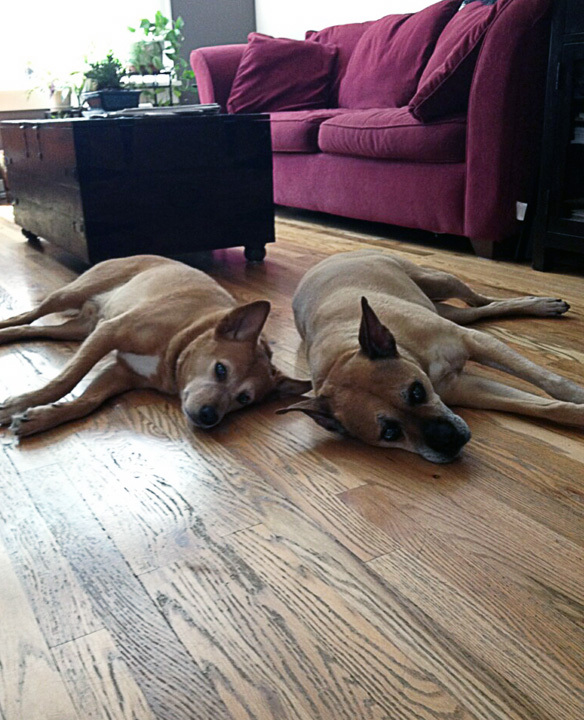 Like Edie, Lucy, their original dog, was patient, tolerant and forgiving. While Miles spent his early days in his crate when Wes, Suellen, and Edie were not at home, Lucy kept him company by sleeping right next to it. Years later when she was diagnosed with Cushing’s Disease, Miles returned her loyalty and friendship in abundance. Her illness helped him turn an emotional corner and during their final years together, he was attentive, loving, and remained close by her side. Suellen says Miles provided her with strength during the darkest days of Lucy’s illness and comfort during and after the heartbreak of her passing. He remained by Suellen’s side, checking on her constantly – even when she was in the shower, he would scratch at the door to make sure she was OK. In his own way repaying the kindness, compassion, and understanding that his family shared with him during his early struggles. Miles, Suellen, Edie, Wes and Lucy on a final visit to the park. Photo used with permission. Had Suellen, Wes, and Edie not adopted Miles, his chance of survival would have been slim. This family is a shining example of compassion and kindness in action and life choices. Wishing them much luck and peace in the days ahead. Pets, like children, are for life. Please do not adopt an animal if you are unable or unwilling to provide a lifetime of loving and compassionate care. If you are ready for adoption, please consider adopting or fostering a special needs dog because second chances are amazing whether you are on the giving or receiving side. If you enjoyed this post, please check out my posts on adopting a puppy mill survivor and adopting a paralyzed cat. Miles is part of The Specials, an award-winning blog series focusing on special needs pet adoption. Senior pets, those with chronic medical issues, behavioral or temperament concerns as well as overlooked or misunderstood breeds like Pits and black cats. If not for the courage and compassion of their adopters, many of these animals might have been euthanized in shelters or died alone and hungry on the streets. You can read more special needs adoption posts here. Disclaimer: I am not an animal behaviorist or dog trainer. If your dog has issues with aggression, reactivity, or anxiety, please consult a professional trainer and behaviorist. What a beautiful story.This however is one of my pet peeve with rescues. This poor dog was returned several times and they did nothing to try to make him more adoptable by getting him help. They just kept adopting him out to the next family waiting to see if disaster happened and he'd get put down.I have so much respect for this family that they had the time, patience, and strength to work through the dog's issues. However, aggression isn't something everyone can handle. It can trigger anxiety, stress, and problems in families that often have long reaching consequences.No aggressive dog should leave a shelter without a referral for a trainer who specializes in handling these behaviors. Traditional obedience classes as stated aren't enough. That is such a great story. Good for those people to have so much patience with Miles. They deserve lots of thanks for saving Miles. Such a beautiful story of love and patience conquering all. We join you in wishing Suellen, Wes, Edie and Miles luck and peace abundant. I am so happy for Miles! He found his way into the most perfect home for him. Edie sounds like such an inspiring young lady. It takes someone special, especially at a young age, to recognize the importance of never giving up in even the most difficult circumstances. And Lucy sounds like she was the perfect canine companion for Miles, and he for her.Growing up, my family had a dog who was aggressive to pretty much anyone and everyone but the immediate people he knew. I remember how we tried all sorts of socialization and training, but he simply did not like other people or animals. That all being said, to those of us that he considered his family, he was just about the most attentive, protective, loyal dog I've ever known. My parents often joke that he was just about the most perfect babysitter they could have ever found for my sister and me. He guarded over us like we were gold. We had him for 12 years, until he passed from liver disease.Thank you for sharing Miles's story with us! Aggressive dogs are very special needs cases in their own way, and I'm so happy that Miles found a family that was willing and able to tend to him and his special needs. Oh what a touching story. Suelllen, Wes and Edie are true heroes for sticking by Miles through all those difficult days, and it seems their efforts were rewarded.Best wishes to Miles and all his loving family, and others taking on similar challenges with such love and care. What a wonderful story and we are so happy for Miles. Love the last picture. What a beautiful family portrait! 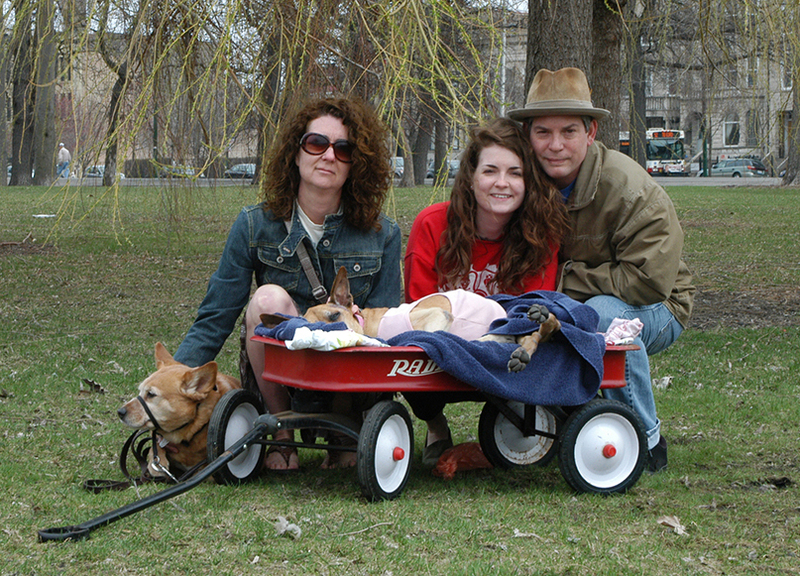 Paws up to this family for taking a chance on Miles. We know it wasn't easy training him and dealing with his issues, but in the long run, it paid off. Another great The Specials story! This is an AMAZING family that is full of understanding being able to see that diamond in the rough! Miles you and your family are so lucky! This story makes me remember that everything that has a breath deserves to be loved. Wonderfully written. What a wonderful story. My mom too believes an adopted pet is for life and she has dealt with a lot of nasty cat issues. Adopting an aggressive dog is a huge challenge, but with work and perseverance, behavior can often be modified. An incredible story of the power of love and commitment! It's wonderful when people are able to work with dogs who need a little bit extra time and patience. That picture in the park brought tears to my eyes. What a wonderful family. Speaking from my own experience, having an aggressive dog is the road less traveled and one of the most difficult. It takes an iron clad commitment and I'm so glad this family had that for Miles. It always touches my heart when an aggressive dog is loved into it's full being. Thank you so much for sharing. A beautiful story indeed…there is a special place in heaven for those who rescue…especially the specials!